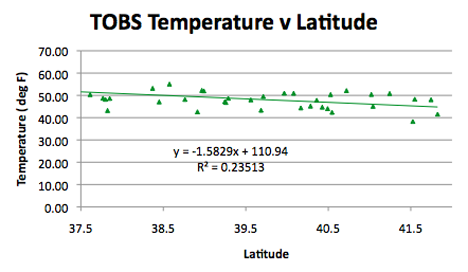 When I first began this review of state temperatures I started in Missouri and moved west in subsequent posts. 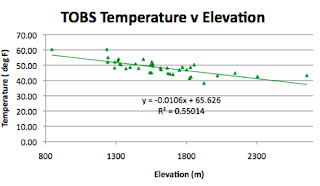 As a result Utah was the fourth state that I reviewed, and then, when the USHCN site also provided the Time of Observation corrected data, I looked at that data for Utah also. 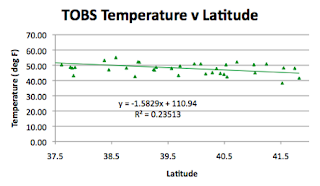 On April 4th Anthony Watts, at WUWT, wrote a post on the temperatures in Utah, based on the publication of a report by Weather Source, on temperatures in that state. 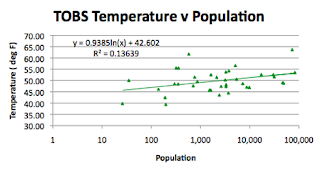 As I have done, so they looked at populations in the state, but dividing population groups into three sizes, showed that temperature rise rates were different for the three groups. The categorization of the station location as to whether it was urban, surrounded by agricultural activity (which will have some impact on temperatures) and those in natural wilderness or where the environs will have a low impact on the temperatures measured by the station. The study grouped the data in a different way than I do, and also only looked at the trends since 1948, while I look back over the data since 1895. But primarily what I wanted to do today was to restructure the Utah posts so that they were in the same format as those of the later sites, where I included a couple of different plots and analysis not in the original posts. So this is a revision, and in the listing on the right side of the page it will replace the original two posts for Utah (though they will still be available through the references at the beginning of this article). 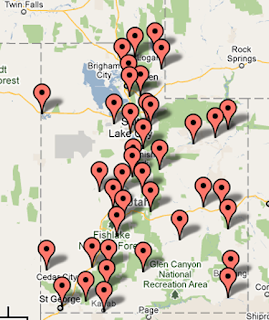 Utah has 40 stations that are not evenly distributed around the state, but clearly focus along a couple of highways. There is only one GISS station in Utah, and it is in Salt Lake City. (It has a full set of data for the period). 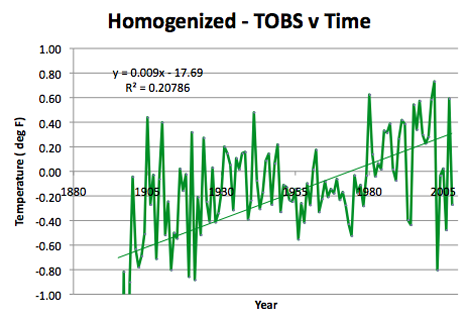 So how does the GISS data compare with the USHCN homogenized data? 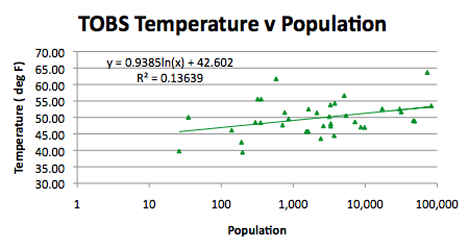 The average difference is that the GISS site is 4 degrees higher than the average USHCN site after the data for those sites has been homogenized. 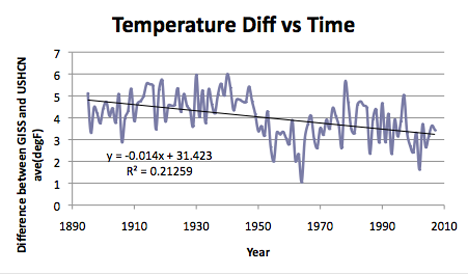 This gives a temperature rise of 1.25 degrees per century, in contrast with the homogenized value of 2.55 degrees. 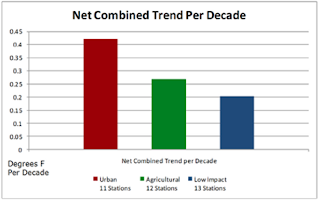 (In comparison the Weather Source rates – calculated however only since 1948, give values of 4.2 degrees per century for urban locations, 2.7 degrees for agricultural sites, and 2 degrees per century for natural wilderness). Looking at the Utah geography the state is 350 miles long and 270 miles wide. It runs from 109 deg W to 114 degW and from 37 to 42 deg N. The highest point is at 4,123 m and the lowest at 609 m. The average elevation is at 1,859 m. The average USHCN station is at an elevation of 1,604 m, and the GISS station is at 1,288 m. Given that there is a strong correlation with elevation (see below) it is not surprising that the GISS station reads high. The center of the state is at 111 deg 41.1” W, 39 deg 23.2”N. The average of the USHCN stations is at 111.6 deg W, 39.4 deg N.
Note that the regression coefficient goes from 0.16 with homogenized data to 0.23 with the original TOBS data. 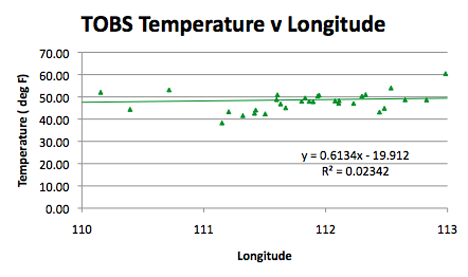 This tends to confirm that the true correlation is not with longitude but rather with elevation. 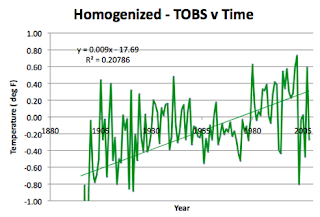 And finally there is the difference between the homogenized and the TOBS data changes over the years. 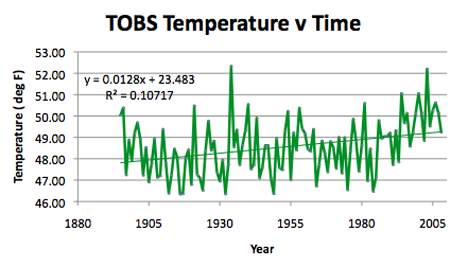 It is interesting to see that sudden upturn at the end.